Centre for Fortean Zoology Australia: Thylacoleo alive and well up north? Thylacoleo alive and well up north? Not everyone is prepared to dismiss the Tweed legend of a large flesh-eating marsupial lion stalking the dense hinterland near Tumbulgum, with a handful of locals convinced the beast is real - according to the Gold Coast Bulletin. For years an urban myth about this ancient creature has circulated on the Tweed. But experts reject the theory, saying Thylacoleo carnifex (murderous lion) was too long extinct. Fossils indicate the marsupial lion was the largest meat-eating mammal known to have ever existed in Australia. The beasts were about 75cm high at the shoulder and about 150cm from head to tail and had retractable claws, a trait unique to marsupials. Tweed Historical Society member Brian Boyd said he heard the stories about a creature near north Tumbulgum and from the descriptions he had been given, it could only be one thing. "I know a few people who have seen the creature. They have recalled it for me and provided sketches," he said. "Every time we get the same description. It looks like a large tiger or lion but it has cramped-up hind legs more like a marsupial. 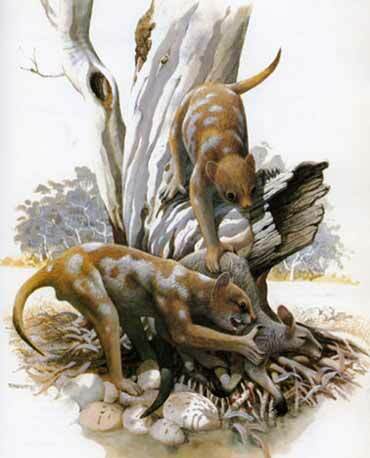 "It has a thick stunted nose like a wombat and is covered in brindle fur with sulphur yellow spots. "These descriptions fit the bill with the marsupial lion." Mr Boyd is so engrossed by the stories and descriptions he has been given by locals that he has built a scale papier mache model of the creature, which turns heads when he puts it on his front lawn in Tweed Heads West. "I have a friend who has seen it twice and he said it was like no other creature he had ever seen in Australia," he said. "Just maybe one of these creatures survived and it is happy out there feeding off the wildlife near Tumbulgum." Northern New South Wales environmental scientist Gary Opit, 64, is adamant a marsupial lion does exist, saying he has seen such a creature at least four times. Mr Opit, who hosts a weekly radio segment on the north coast about Australian wildlife, says his encounters with the beast have stretched as far north as Mt Tamborine. "I first saw it in 1969 when I was working as a National Park Ranger at O'Reilly's," he said. "I got a perfect view of it and you could tell it was some type of marsupial because it had that waddling walk." Mr Opit, who grew up on the Gold Coast and studied at Griffith University, said he had seen a marsupial lion again in the Billinudgel Nature Reserve several times since 1995. Jean-Marc Hero, an associate professor with the Griffith University School of Environment, is less convinced about the possibility a marsupial lion has survived. Prof Hero said no physical evidence of live marsupial lions had been recovered since British settlement. "It's more likely to be a quoll or an escaped feral cat, which can get quite large," he said. "You certainly get quolls out at Springbrook so it would be possible a large one has ventured down further near Tumbulgum." What cryptid is most likely to be found in Australia? Monster pig no hoax - 2009 deja vu!